As the weather turns colder, staying warm and cozy is at the forefront of our minds—at least it’s in the forefront of my mind! I love the Organic Chenille Waffle Weave Blanket because it’s healthy, but mostly I love it for the warmth. It’s a medium weight, 100% organic cotton blanket that is great for year-round use. During the fall and winter months, I combine it with a wool comforter for extra warmth. The organic yarn used is grown in the USA and is GOTS certified. The chenille waffle weave is so soft and cuddly, I’ve been known to take it off the bed and wrap up in it on the couch while reading or watching television! Unlike a more tightly woven chenille blanket that can feel a little stiff, the waffle weave allows for more flexibility and comfort. 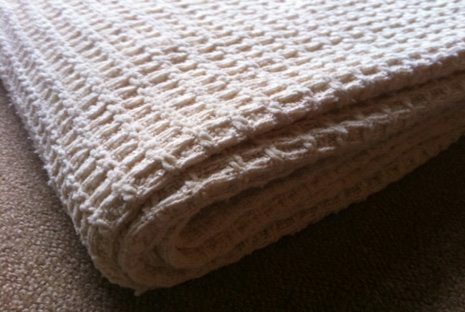 The Organic Chenille Waffle Weave Blanket is an undyed natural color and is machine washable. Win the Organic Chenille Waffle Weave Blanket, choose your size, in our November giveaway! ENTER to win! This blanket is worth up to $155! No purchase necessary to win. Giveaway runs from November 3rd through November 30th. Congrats to Kelly B of Orange, CA, you won this giveaway!